Bike to work? Take these easy steps to ride safe, protect your bike, and take advantage of all Harvard has to offer bicyclists! To make life harder for thieves and easier for pedestrians, cyclists who ride to and around campus should take advantage of the University’s parking spots and racks, remember to lock their bikes, and stay off the sidewalk. Bike racks and covered parking are available around the Harvard campus. CommuterChoice offers discounted helmets available for purchase for $10.00. Bike repair stations are located across campus for your convenience and are equipped with an air pump and basic hand tools such as screwdrivers, wrenches, and tire levers. Locations: Pound Hall, 1563 Mass Ave in Cambridge; Harvard i-lab, 125 Western Ave in Allston; 46 Blackstone Street in Cambridge, and the Science Center Plaza. Cyclists have a right to the road but also a responsibility to follow the rules. Cycling is prohibited in Harvard Yard and several other areas of campus—signs are posted to alert riders when they must walk their bikes. Bicycling on the sidewalk is not permitted in Harvard Square or in several other locations in Cambridge. Staff and students are strongly encouraged to register their bikes with the University police department to aid in the recovery of stolen or lost bikes. Bikes should be locked in a rack or in a covered bike parking shelter where available. Locking to a street sign is OK, but never in the path of pedestrians or in a way that blocks handicap access. The city of Cambridge asks cyclists to leave at least 36 inches of an obstruction-free path for travel. Additionally, bicycles cannot be parked against fire hydrants, hand railings, benches, trees, trash receptacles, or parking meters. Cyclists should lock their bikes using a U-lock, chain, or cable. Most cyclists lock their frame and one wheel to a bike rack. If a U-lock is used to lock the front wheel and frame to the rack, looping a cable through the back wheel and locking it to the U-lock is a good idea, especially if the bike has a quick-release system on the wheels. Cyclists should not use racks or covered parking for long-term storage. Contact CommuterChoice to learn more about storage facilities. Choose from a series of free bike workshops offered by the city of Cambridge. 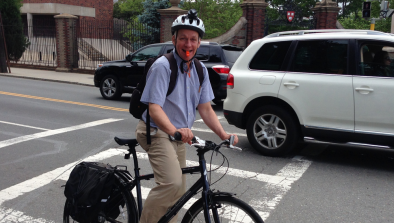 Sign up for Harvard's bicycle commuter reimbursement program.